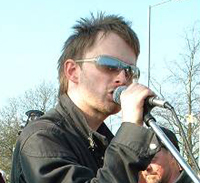 “My name’s Thom Yorke, I’m in a band called Radiohead. I don’t know if anybody’s heard of me. We feel strongly about this. I’ve spent a lot of time in America recently and I went to two demos in America, one in LA and one in San Francisco, and you’d be amazed how many Americans are scared shitless of this administration. They are terrified. They didn’t vote them in, they don’t want them in and they’re all on the streets, which, frankly, in LA is very unusual. I reckon there’s probably people on the other side of this fence (RAF Fairford) who feel the same way. I think for the first time, a war is being waged and there is no way the majority of people in a so called democracy state believe in that war.